Hoe! Hoe! Hoe! Migrant Green Giant! With FarmBucks (the local currency), players may buy new PARCELS OF LAND and/or pay to SWITCH TO A DIFFERENT PLANTING CROP from the previous Round. Each Round, the price to do either increases. There are four different Crops (Corn, Soybeans, Cotton, and Rice). There is no charge to plant the same Crop as last Round. Players only have 1 Planting Crop per Round. Parcels are land areas on the board; some have a RIVER running through them, others do not. Each Parcel can potentially produce 2 different Crops (however, only one may be produced per Round). Each Parcel shows a CROP TRACK of the amount of a particular Crop that will be produced on the parcel, if that Planting Crop is selected. Parcels also show a VP amount (the larger the VP, the smaller the values on the Crop Track). When a new parcel is purchased, a player places a BARN of his color on the center space of the Crop Track. The cost to buy a new Parcel next to a previously owned Parcel is reduced slightly. Players draw RAIN cards from the RAIN DECK equal to the amount of Parcels they own. Players play Rain cards from their hands at will (or may keep them for further Rounds) until no one wishes to play another Rain card. Rain cards show values from -3 to +3. Playing Rain lets a player move the CLOUD TOKEN (as indicated by the Rain card played) on the RAIN TRACK. The Rain Track runs from 0 to 20, indicating how much rain “the county” receives this year. When everyone stops playing Rain cards, if the Cloud is on space 5 or less, there is a DROUGHT, and only Parcels with Rivers will produce Crops this year. If the Cloud is on space 15 or above, there is a FLOOD, and only Parcels without Rivers will produce Crops this year. Roll (number of players+1)d6 to determine how many MIGRANT GREEN GIANTS come to town this year to work the fields. Players secretly write down how many Giants they want to hire. Players may discuss before deciding on their hire amount. Players then reveal their amounts. An additional 1d6 is rolled and added to the dice total. If the total amount of Giants all players want to hire is less than (or equal to) the total amount of the dice roll, then all players take their amount desired of GIANT FIGURES. If the total amount of desired hires is more than then dice roll, then the player (or players tied) with the most desired hires gets none (Giants abhor being forced to work for demanding land owners!). Players may discuss, barter, or trade money, Parcels, Giants, future Crops, Rain Cards, etc. at any point. Players place 1 Giant on each Parcel they wish to be harvested. Parcels affected by Flood/Drought will not produce Crops regardless if Giants are working those Parcels. Players tally up their harvest. On each Parcel a player owns that has a Giant and is not affected by Flood/Drought, check the Crop Track, and if a Crop matches the player’s Planted Crop, then the players earns the amount shown in FarmBucks. Move the player’s barn one space on the track TOWARDS large Crop icon that matches the selected Crop. Parcels which do not have the player’s selected Crop on their Crop Track do not produce anything in this Round. However, the Barn on such Parcels is moved, if need be, one space towards the center space on the Parcel’s Crop Track. Do not move the Barn on flooded or Drought-ed Parcels. Remove all Giants from the board. After 6 cycles through the Rain deck, the game is over. The player who has the most total VP shown on they Parcels they own wins. Red (with his barn) owns the Parcel above. 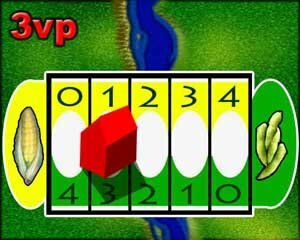 To produce 1 FarmBuck from Corn, Red must have Corn as his selected Crop, place a Giant on this Parcel to harvest it, and not have the Rain Track show Flood, due to the river. Then the barn move one space over to the left. This land has been “farmed out” of Corn for now (but will produce lots of soybeans!). To produce 3 FarmBucks from Soybeans, Red must have Soybeans as his selected Crop, place a Giant on this Parcel to harvest it, and not have the Rain Track show Flood, due to the river. Then the barn move one space over to the right.